No, your eyes are not deceiving you. I, of all people, made these jeans. See, it's a long story, but I'll keep it brief. Let's go back to last summer when I preached on the evils of skinny jeans, declared that they were sent from Satan himself and screamed from the rafters that you'd never, EVER catch me in a pair! Well... these aren't exactly "skinny jeans", they're "straight-leg jeans"! LOL I know, I know -- semantics! I had been seeing a lot of "not-so-skinny" women that looked pretty good in this style. Then I saw Chanel with a pair on and she looked fabulous, and I knew right then, I had to atleast go and try on some. So, I decided to bite the bullet, hit the store and try them on. 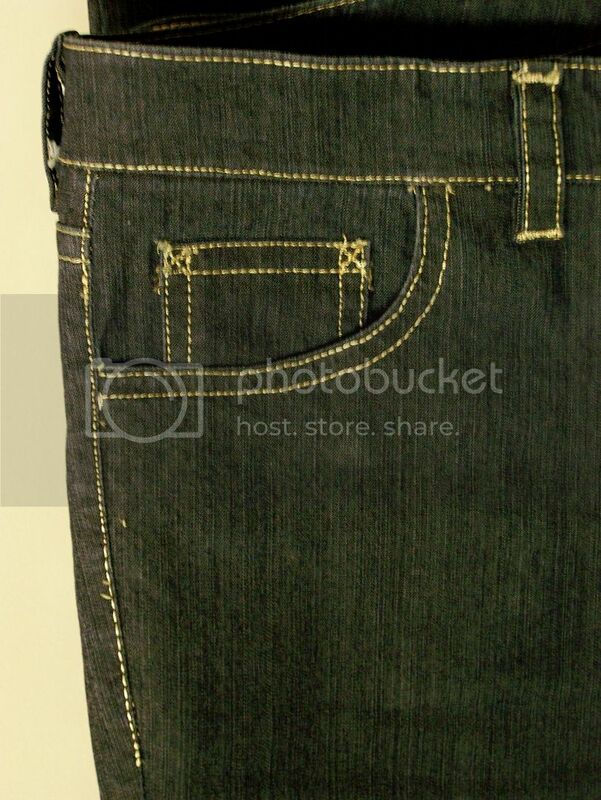 Okay... if I were going to struggle into a pair of these jeans, they had to be top-of-the-line, premium denium. I tried the William Rast Straight Leg Jeans, size 32 that retail for $224, and the fit was not terrible. The only thing I didn't like about them was the very low rise... no way in the world would I be able to bend over and pick anything up without showing all of the goodies. Since I had made a pair of jeans before, I decided to take the plunge again. 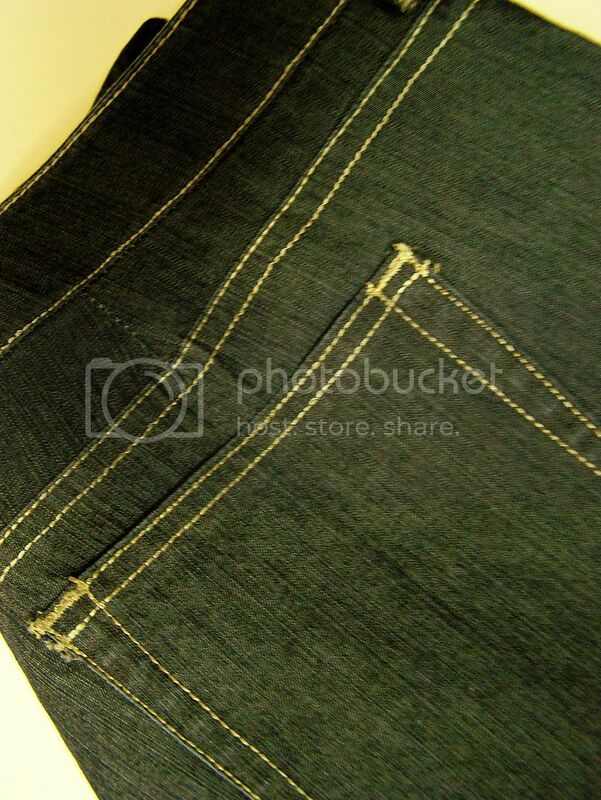 Description: Close-fitting, low-rise pants have front fly, front zipper, front buttonhole and button closure, back yoke, carriers, front and back pockets, edge-stitch and topstitch detail throughout, with plain back pockets. These jeans were very easy to make, just a basic pants construction with the exception of the yoke in back and all of the tedious topstitching. There were several modifications I made to get my desired look and fit. Added a couple of inches to the rise both front and back. My rise is 10" in the front and 15" in the back. Added 1.5" to the inseam. My inseam is 33". Added 1" to the leg opening by adding ¼" to each side on the bottom of the front and back pieces. My leg opening is 15" wide. Added darts to the yoke. When I tried them on before I added the waistband, I could tell that I would have some gaping. To solve this problem, I added darts. Drafted new back pockets. It baffles me that the pattern designer didn't think to keep the back pockets proportionate in size as she took the jean size from 6 - 20. I like a larger pocket so I used the dimensions from a favorite pair I own.